We are all now going through Great Lent. The devil has mocked us all, introducing so many afflictions during these days during which we should be removing ourselves from the agitation of this world by immersing ourselves in prayer, restraining ourselves by fasting, and repenting of our own sins. But perhaps the Lord is leading us through these trials during the holy days of Great Lent so that we would all recognize our responsibility for our land, for Holy Russia, and for the Orthodox faith. On March 24, 2012, the Saturday of the fourth week of Great Lent, His Holiness, Patriarch Kirill of Moscow and All Russia, celebrated the Divine Liturgy of St. John Chrysostom in the Church of the Deposition of the Precious Robe of the Lord in Moscow. In his remarks following the Divine Liturgy, the Primate of the Russian Church touched upon the recent blasphemous action that took place in the Church of Christ the Savior, which has preserved a portion of the Lord’s Robe since 2007. But what, seemingly, should be the case? The times have passed when people resolved these questions by force – and glory to God, that they are gone. But what should have been the case in our land, which owes its very existence in many ways to the Orthodox Church and the Orthodox faith, which roused our nation to its greatest feats, including the defense of the Fatherland in 1812? Indeed, it was in the name of this victory that the Church of Christ the Savior was built. No, people have appeared who justify this blasphemy, minimizing it, attempting to portray it as some sort of funny joke. And sadly – and my heart breaks from bitterness – among these people are those who call themselves Orthodox. 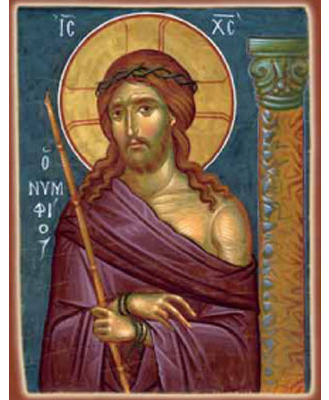 Let us draw a connection between the Church of the Deposition of the Robe here, on the Don, the events of the seventeenth century, and to what transpired in the twenty-first century in the presence of the great sacred object of our Church and of the entire Orthodox world – before the portion of the Lord’s Robe. I think no believing person should say: “this does not concern me” or “this is none of my business.” This cannot but wound every Orthodox Christian. Therefore I call upon you all to intensify your prayers for our country and for our nation. For we will have no future if we begin to mock our sacred objects and if this mockery strikes anyone as some sort of act of valor, as some sort of expression of political protest, or as some kind of appropriate action or harmless joke. We are all now going through Great Lent. The devil has mocked us all, introducing so many afflictions during these days during which we should be removing ourselves from the agitation of this world by immersing ourselves in prayer, restraining ourselves by fasting, and repenting of our own sins. But perhaps the Lord is leading us through these trials during the holy days of Great Lent so that we would all recognize our responsibility for our land, for Holy Russia, and for the Orthodox faith. This feeling is expressed in an Orthodox person first of all by fervent prayer to God. These people do not believe in the power of prayer. They believe in the power of propaganda, in the power of lies and slander, in the power of the Internet, in the power of the mass media, and in the power of money and arms. We believe in the power of prayer. I call upon the entire Russian Church to pray fervently and sincerely for our country, for our faith, and for our people, that the Lord would forgive us our transgressions and once again incline His mercy to us, granting us the power of the grace of the Holy Spirit; that having passed through trials and temptations, we would emerge from them purified, strengthened, and capable of constructing our future in accordance with the Law of God and with human conscience.